Brooks Kendrick- Exemplifies the Aims of Scouting! Recently I attended a Court of Honor in Logan, Utah that recognized an incredible young man! Brooks Kendrick was given the prestigious Ranger Award in his Venturing Crew. 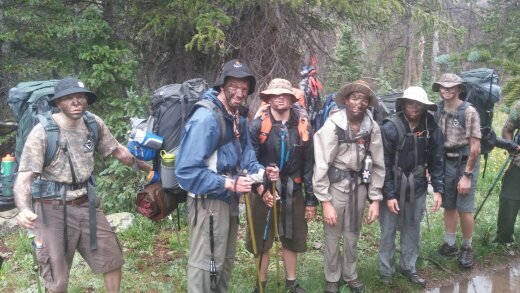 Reflecting on his Ranger Trek, Brooks writes, “The Ranger Trek was an amazing experience for me. You learn a lot of ranger skills and outdoors skills. First of all, what to pack, how much to pack, how to wear your pack, etc.. How to use a compass and a map, as well as a GPS. How to fish and then clean and cook them. My point is you learn useful skills necessary for a Boy Scout, but there is much, much more to get out of the Ranger Trek. I got to watch first hand three separate priest quorums go through several stages of teamwork. It was amazing that in one week a team could grow so close and learn to perform together, to stop thinking about themselves, and start thinking about others. Each person’s ability to lead grew exponentially. By doing the Kodiak exercises, each person’s leadership skills were challenged and raised to a higher level. Reed Tanner, leader and mentor to Brooks states, “Brooks is a great leader and awesome kid. He is an Eagle Scout and has earned both his Denali and Ranger Awards. Brooks is ultra-motivated and has been the back bone of the program at every level of Scouting he has participated in. Brooks is extremely fit and spent the last few months wrestling for Sky View High School. “This summer he will start a new adventure as he heads off to boot camp where he will become a soldier in the United States Army. Shortly after boot camp, Brooks will head out on his mission. Brooks has developed into an incredible young man with a passion for the outdoors. He is a good citizen and will be a pillar of the community as he gets the chance to give back to Scouting as well as serves his country. The Trapper Trails Council salutes Brooks Kendrick! ← An Anniversary to Remember!